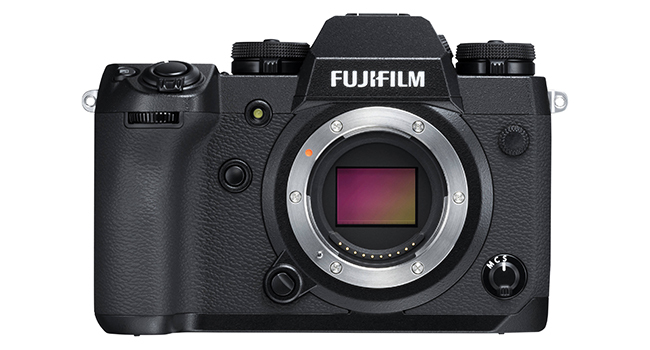 The Fujifilm X-H1 mirrorless camera is a chunkier and more fully fledged shift up from the X-T2 with the same 24MP sensor, but with more enhanced video capabilities. There’s also in body image stabilization, sloped viewfinder, and topside LCD screen, along with a healthily sized grip and larger buttons. Clearly building on the success of the X-T2, the upgrades aren’t just external. There’s also an improved AF system, better operation in low light, ‘Eterna’ Film Simulation, anti-flicker, individual settings for both stills and video such as exposure, and movie Silent control to disable the aperture ring and other dials. More silent running has also been incorporated into a more quiet shutter mechanism which also incorporates an Electronic First Curtain (EFC) shutter mode. All things adding up to a nice all-rounder, which is building on the success of the X-T2. The X-H1 feels fuller and fatter than the X-T2, with a more substantial grip. The body is roughly 25% deeper and the magnesium alloy body has been made more durable. The addition of a more pronounced grip means the camera feels more like a traditional DSLR, but it does mean you lose the exposure compensation dial. the other big change is the top plate LCD screen which is always on but can be customized to show all the information you need. The viewfinder has also been upgraded to a 1280 x 960 resolution, with a 0.75x magnification, which is very clear and bright. The addition of a touchscreen adds some nice functionality such as AF selection and even a choice of which area of the screen is active at any one time. You have a lot of options here, like the use of the touchscreen with the Q menu, along with a very functional way of shooting video via the Movie Silent Control mode. Setting AF points is affected by the touchscreen, although a little slow in functionality. Natural Live View via the rear screen gives a neutral view which changes in brightness as you change exposure. There are essentially a lot of configurable controls and settings for both stills and video. Some of them overlap and can seem quite convoluted at times. The camera is trying equally hard to be excellent with both stills and video, possibly more capable with stills, but it’s a matter of filtering out what you don’t need functionality-wise, even though this can be time-consuming to set up. You can change the auto ISO via 3 presets, each allowing an upper and lower ISO setting, with the ability to change the shutter speed. Auto ISO works in manual exposure for both stills and video. When it comes to batteries the X-H1 can use the X-series W-126S types and the older W-126 ones, but with fewer shots per charge. You will get 300 or so shots per charge which isn’t the greatest, so always carry a few spares or you could go for the VPB-XH1 power grip. The X-H1 also has the ability to charge via a USB port, making charging the battery that bit more convenient. Built for being an all-rounder, the X-H1 does very well at processing especially with the upgraded autofocus helping out. Once the continuous autofocus has been set up, the X-H1 copes well with action and sports images, maybe not on the lines of something like the Nikon D500, but still very capable. The face detection mode works well as with the built-in image stabilization, which does help a lot freezing movement. The Face detection mode works okay in low light, but maybe not as good as some of the competitors. For ultimate quality, such as landscape shots, it’s probably the same as the X-T2. Larger sensor cameras are going to give you more image quality, but that’s also with a more weighty setup. There is at least Bluetooth and Wi-Fi communication which means your images can be sent to your smartphone quite easily. Just like its predecessor, it tipped the scales for video with 4K with oversampling and less rolling shutter and less aliasing than its counterparts. The addition of being able to have independent settings for both stills and video is a great feature, as is the 8-bit F-Log recording and film simulation modes which give great results straight away. It can definitely compare to the X-T2, with added stabilization, longer shooting time and more ways to control settings in your video. Video exposure is easily changed by the control points and dials and the use of the movie silent control with the touchscreen is a very helpful addition. The autofocus in video mode lets you select between the 91 AF points, with two options controlling the depth and speed of the motor. In-body stabilization is the first for the company, which means that you can get roughly 3 stops extra with a telephoto lens, but not as much if using wide-angle. This can definitely make the difference in certain situations if you don’t have your tripod. RAW file processing is comparable to its predecessor, while the JPEG engine produces some rich colors especially with the Provia/Standard color mode. There can be a fair amount of noise reduction and sharpening, so you may want to turn this down if it’s not to your liking. The X-H1 is definitely a step up from the X-T2, but it also means that it’s now competing against some serious opposition. The Sony a6500, a7 III or Nikon’s D500 are all worthy and comparable cameras, depending on your shooting preferences. The X-H1 is trying to be a great all-rounder, with more traditional DSLR feel, without being wholly dedicated to one aspect. If you want a camera that can cover most bases, the X-H1 will fit you well, but its price point is also up against some hefty competition from other brands. As a good all-rounder it fits quite well, but if you want something more dedicated, such as for action or ultimate image quality, you may look at some of the competitors instead.